One of Riko’s claims to fame (according to their menu), is having “the best rotisserie chicken.” Well, there’s at least 4 different chicken places on Greenpoint Ave., all representing a different South American country. Challenge accepted! Results of the humble representative from Peru: it’s damn good rotisserie chicken! 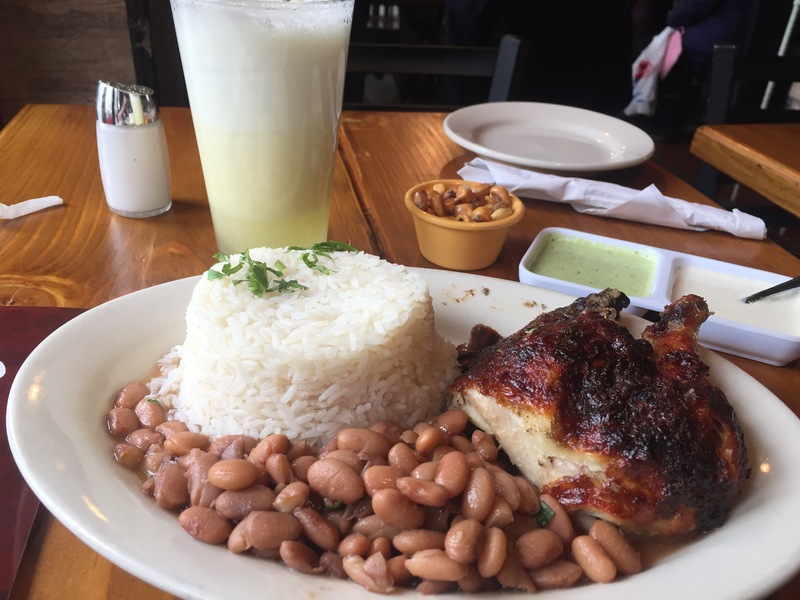 A 1/4 lb chicken lunch with a side of arroz y frijoles (= rice and pinto beans), or papas fritas = French fries with a green salad for $5.50. Since it was so cheap, I also ordered a Peruvian dessert: Mazamorra morada, which is a fruit-filled gelatin made from purple corn. It was topped with Carmel-topped whipped cream. It was rich, jelly-like and just too much of it. I couldn’t tell what fruits that they used; maybe they fished them out of the sangria pitcher. Unfortunately, the good mood that the food at Riko’s was quickly disappearing, thanks to the 7 train. Thanks to delays on the Queens line, and closing of most stops on the Manhattan line, it took 25 minutes just to reach to 74th St. (Roosevelt Ave.). A quick ride on the E, and I was back to work. Was it worth it? Yes. Is the 7 train evil? Most definitely!